Don’t start in a hole! Cyclocross is great fun and makes for some excellent fall training, but be careful and smartly manage your fatigue if you just completed a full season of road or MTB racing. I’ve seen many riders transition from mid to late summer road racing right into CX with little regard for rest. Looking at their data, I typically ask my clients transitioning into cross to rest till their Training Stress Balance (TSB) is more than positive 10 TSS/day for at least 5-7 days. This rule can vary slightly based on overall fitness and training maturity, but ignoring this rule can lead to fatigue issues and the inability to train and race at the athlete’s best. Note the current rest period as we prepare to transition to cyclocross training. This athlete’s TSB has been more than positive 10 TSS/day for the last five days. 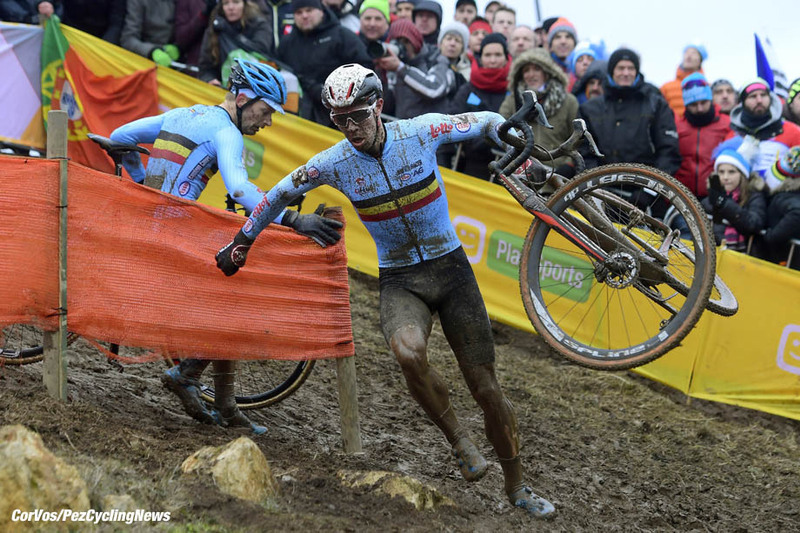 A simple periodization strategy should be undertaken for cyclocross if possible. It’s hard to summarize all activities and priorities, but here’s a simple summary of activity and timelines. Cyclocross-specific training rarely, if ever, needs to be over two hours in a session, but spending a little time building an aerobic base will help. How? Some aerobic base will allow you to complete more work at higher intensity and will help you recover from harder workouts faster. If you have raced a full road or mountain bike season, you will probably need only two to three weeks after a proper rest to move into higher-intensity training. If you haven’t been training at all, I suggest eight weeks of aerobic base building to prepare for the season. Yes, cyclocross takes strong anaerobic capacity, endurance, and power, but those need to be built on a high Functional Threshold Power (FTP) base. I can’t tell you the number of discussions I’ve had with cyclocross racers who feel they just need to be able to surge more and burn one more match, so they adjust their training by adding more short interval days and extend the number of intervals (do more). This assumption is often faulty. If you look the race files, it is less related to the number of surges or matches as it is to the average of those over time. Riders typically hang with the lead pack from the start till around 12-16 minutes of early race surging and positioning, and then they drop off the pace. If you review the power and normalized power from such races, typically riders are about 10% over FTP for that time frame, which is the reason for the drop-off, not the actually number of surges or matches. Focusing on increasing your FTP will allow you to improve your ability to stay with the pack and not get dropped out the back. That being said, let’s think about the nature of the power demand for cyclocross. As discussed earlier, the demand is more stochastic than time trial or road racing, and our training strategies should reflect that and change your approach toward FTP intervals. For cyclocross, change the classic approach towards FTP from a lot of steady-state intervals to longer mixed intervals. Instead of heading out and doing 2 x 20 minutes on the road in a steady fashion, head to the local park and do 2 x 20 “mixed power” FTP intervals, varying the effort either by timing (like a burst every 2 minutes) or by doing a simple ride at race pace and attacking corners and obstacles. Still target the same average power, just look to increase the variability. Most head units now track Normalized Power, which can be used in intervals over 12 minutes (the normalized power algorithm is a rolling time basis and is not accurate under 10 minutes) to target the power demands. To better prepare for the demands of cyclocross, you need to have a focus on Supra-Threshold, or in WKO4 speak, your FTP/FRC (Functional Reserve Capacity) training level. This level is slightly above your FTP and can typically be sustained for times ranging from 3-20 minutes. This targeted zone is based on your unique power curve that individualizes the workout intensity to your unique physiology. Workouts in the FTP/FRC zone are an intensive approach, raising FTP from above. I recommend a steady diet of these done in both a steady-state fashion (steady maintained power) and in micro-sprint power, where you fluctuate power in a pattern, such as 15 seconds on and 15 seconds off. 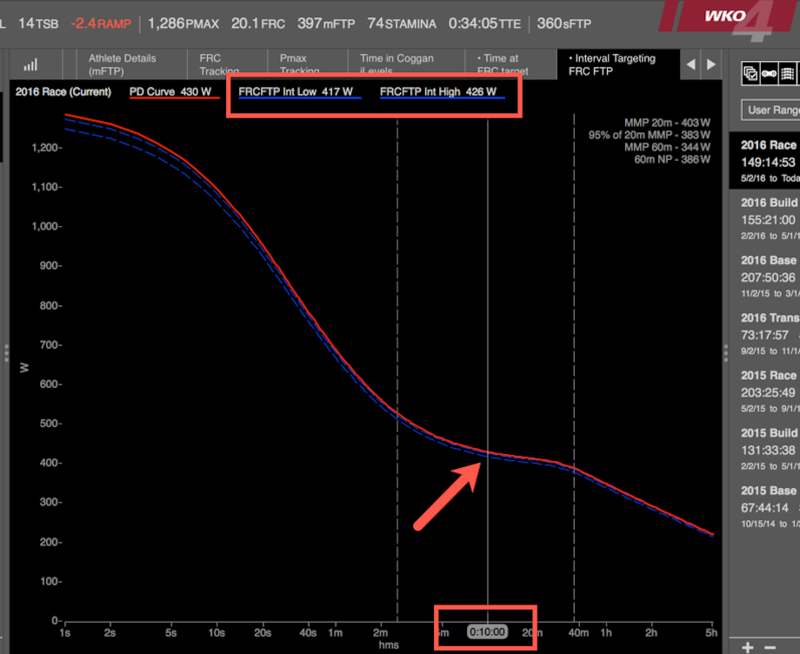 Utilizing the power duration curve of estimated maximal power for the selected time range, you can assign a simple % of equation to create a custom targeted training level to build FRC/FTP. Functional Reserve Capacity is a model-driven measurement of anaerobic work capacity (AWC) and is specifically defined as “the total amount of work that can be done during continuous exercise above FTP before fatigue occurs. Units are kJ or J/kg.” The higher this physiological marker is, the more continuous time we can spend above FTP. The trick is to build it correctly. The best return on investment in limited time workouts for building FRC is simple, short, maximal efforts. The challenge is that most cyclists do not often train at max; they just think they do. What do I mean? Bike racing teaches us that we have a limited recovery time, so we often build our workouts like that; a typical example is doing 1-minute max efforts with 2-minute recovery, targeting 5-8 of these in an interval workout. This is not maximal, however. True maximal efforts require at least 7-10 minutes of full recovery to allow for a repeat of a max-style performance. Targeted time and intensity using iLevels as your max power and shortest time “edge” of the training level as demonstrated in this image. The training advice I’ve given here really is about individualizing training. Each athlete is unique, and determining and focusing on that uniqueness is the key to success. Check out this free webinar by Tim on cyclocross demands and training, including sample workouts.